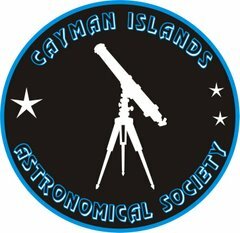 Weather permitting; we will meet on Thursday, 18th October, 6.30 p.m. at Pedro Castle. If the sky is more than 50% cloud covered, we cancel. This can be, as you will appreciate, a sometimes difficult decision. 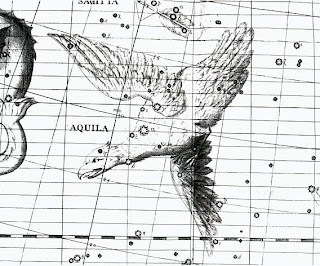 Almost directly overhead at viewing time is the constellation Aquila. Aquila lies just a few degrees north of the celestial equator and is located along the Milky Way. Because of this location along the line of our galaxy, many clusters and nebulae are found within its borders, but they are dim and there are few galaxies. Astronomers observed two major novae in Aquila, the first one being in 389 BC. It was recorded as brighter than the planet Venus. The second one was observed in the year 1918 (Nova Aquilae). It was brighter than Altair. A nova should not be confused with a supernova. A nova is an old star that brightens temporarily, and a supernova (dying star) is a massive star exploding. NASA’s Pioneer 11 mission will pass near one of constellation Aquila’s stars in about four million years. The name Altair comes from the Arabic al-nasr al-ta’ir, meaning ‘flying eagle’ or ‘vulture’. Ptolemy called this star Aetus, the eagle, the same as the constellation. The German scholar Paul Kunitzsch notes that the Babylonians and Sumerians referred to Altair as the eagle star, testimony to an even more ancient origin of the name. 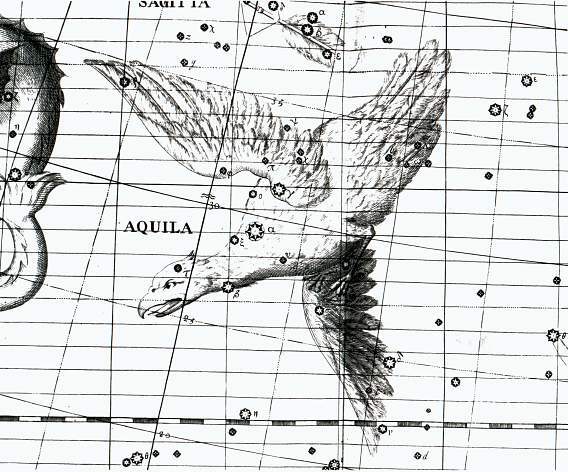 Altair’s neighbouring stars Beta and Gamma Aquilae lie in the eagle’s neck and in its left shoulder respectively, according to Ptolemy’s description. These two stars have their own names, Alshain and Tarazed, which come from a Persian translation of an old Arabic word meaning ‘the balance’. In China, Altair and its two flanking stars, Beta and Gamma Aquilae, were known as Hegu, a large battle drum – beating the drum was a signal for the army to attack. The line to the south formed by Theta, 62, 58 and Eta Aquilae was Tianfu, the drumstick. 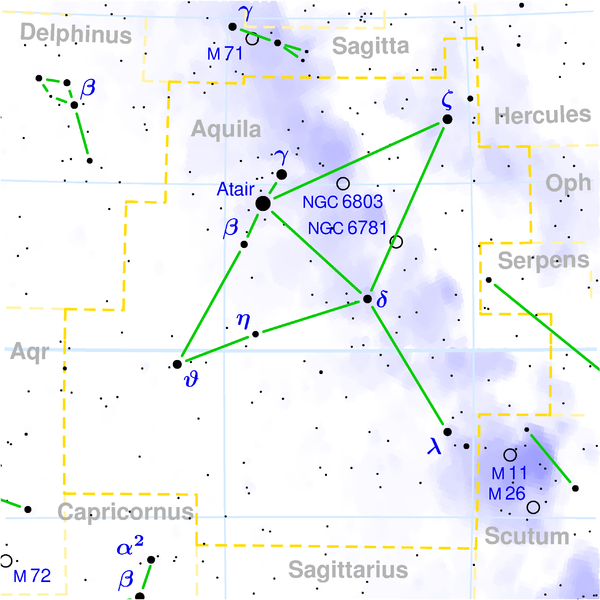 Delta Aquilae and surrounding stars including Mu, Sigma and Iota were Youqi, a banner flying on the right side of the drum, while the stars of Sagitta to the north were a banner on the left of the drum. 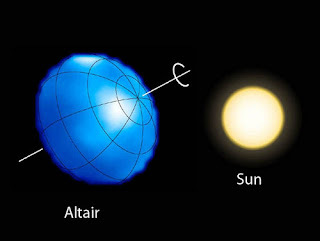 Altair and its attendant stars also had two other identifications. In one they were known as the Three Generals, the commanding officer in the centre flanked by two subordinates. Aquila represents an eagle, the thunderbird of the Greeks. There are several explanations for the presence of this eagle in the sky. In Greek and Roman mythology, the eagle was the bird of Zeus, carrying (and retrieving) the thunderbolts which the wrathful god hurled at his enemies. But the eagle was involved in love as well as war. According to one story, Aquila is the eagle that snatched up the beautiful Trojan boy Ganymede, son of King Tros, to become the cup-bearer of the gods on Olympus. Authorities such as the Roman poet Ovid say that Zeus turned himself into an eagle, whereas others say that the eagle was simply sent by Zeus. Ganymede himself is represented by the neighbouring constellation of Aquarius, and star charts show Aquila swooping down towards Aquarius. Germanicus Caesar says that the eagle is guarding the arrow of Eros (neighbouring Sagitta) which made Zeus love-struck.